As far as justice is concerned...unfortunately all we have (again) is a lot of play-acting and word-playing and a bit of fore-playing (but much more expensive to enact at $220 mil...all those lawyer fees....). Incidentally something which aroused our curiosity is the Cambodian word for genocide: prolai pouch-sas. We are no linguists but "prolai" in Sanskrit (used in Bengali as well) denotes a state of crisis (at the end of times level). Perhaps a person who knows will step forward and clarify? August 7 was supposed to be judgment day for the last two leaders of the Khmer Rouge regime. Thirty-five years after the end of Pol Pot’s calamitous agrarian revolution, a United Nations-backed court in Phnom Penh found the movement’s chief ideologue Nuon Chea and the former president Khieu Samphan guilty of crimes against humanity and sentenced them to life in prison. Finally, some were saying, the Khmer Rouge’s top echelon was being held accountable for a utopian folly that killed as many as two million people. For what the US Congress once described as “one of the clearest examples of genocide in recent history.” For what various American officials — Hillary Clinton, Steven Rapp, Samantha Power — have also called a genocide. Except that neither Nuon Chea nor Khieu Samphan was convicted of genocide on August 7. And the tribunal will never even consider that charge in connection with the vast majority of the Khmer Rouge’s victims, the Khmer people, who make up 90 percent of the Cambodian population today. 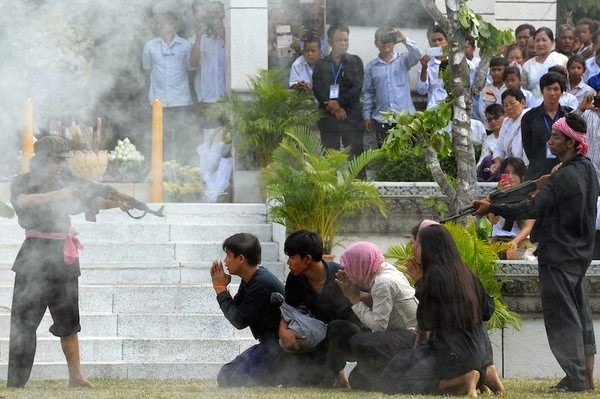 When the Extraordinary Chambers in the Courts of Cambodia, as this tribunal is formally called, does address genocide in a second phase of the leaders’ trial, it will do so only in relation to two Cambodian minorities: the Vietnamese and the Cham, a Muslim group. This is an awkward development. Some 20,000 Vietnamese and 90,000 Cham are believed to have died under Pol Pot — compared to well over 1.3 million Khmer, according to the most conservative estimates. There is, in fact, a simple explanation for why most of the Khmer Rouge’s crimes, though widely thought to be a paradigmatic example of genocide, both inside and outside Cambodia, are not actually that: the 1948 Genocide Convention, which codified the concept into international law, deliberately ruled out its application to political pogroms and class war — the signal crimes of Stalin, Mao, and Pol Pot. But the language adopted in the convention was also a compromise reflecting the power dynamics of the day. The Soviet Union, for example, opposed including “political” in the list of protected groups in the definition, presumably because it was wary of getting into trouble for purging its opponents back home. Propaganda became even more necessary as the Vietnamese’s lightning liberation turned into a lengthy occupation; their continued presence risked rekindling many Cambodians’ ancestral anxiety about Vietnamese expansionism — an anxiety so deeply engrained it had long been the fodder of terrifying children’s fairytales. Schools were supplied with new textbooks short on pedagogy and long on hyperbole. “The Pol Pot-Ieng Sary clique killed more than 3 million people and completely destroyed everything in Cambodia,” read one book intended for the second grade. “We are absolutely furious and strongly struggle against these atrocities.” January 7, the day in 1979 that Vietnamese troops seized Phnom Penh from the Khmer Rouge, became celebrated as Victory over Genocide Day. And so it was that almost as soon as the Khmer phrase for “genocide” came to mean anything to Cambodians, it meant something both broader and more precise than the destruction of a nation, ethnicity, race, or religion “as such”: it meant the Khmer Rouge’s attempt to exterminate Cambodians, mostly Khmer — their own group. (Kong Sothanarith, a forty-something news editor at Voice of America, told me recently, “It’s when I went into journalism that I realized the word meant almost exactly the opposite of what I had been taught.”) And the term took. The horror of the Khmer Rouge “genocide” was a rare matter on which Vietnamese occupiers and Cambodian occupied could agree. On April 30, 1994 -– while a bona fide genocide was raging in Rwanda — the US Congress passed the Cambodian Genocide Justice Act, which created the Office of Cambodian Genocide Investigations in the US State Department, which in turn created the Cambodian Genocide Program at Yale. The idea was to document the Khmer Rouge’s crimes and at some point prosecute them. Very soon after that, the UN Security Council set up two tribunals to judge abuses committed when Yugoslavia and Rwanda imploded — the first international criminal courts since Nuremberg and the Tokyo trials. That the concept of genocide was stretched this way is a measure of the cachet and clout it had acquired by then. After all, there was no legal gap that needed filling: the Khmer Rouge’s crimes readily fell under other categories, like crimes against humanity (a widespread and systematic attack against civilians) or war crimes (severe mistreatment of certain combatants and civilians during a conflict). And most jurists would agree that international law establishes no formal hierarchy among mass crimes. And so when the ECCC came into being in 2006, genocide was included in its mandate (along with crimes against humanity, war crimes, and violations of the Cambodian penal code). And under the court’s civil law procedure, it would be up to two investigating judges to lead a factual inquiry and determine how to characterize any crimes they uncovered — a technical-seeming task fraught with high-stakes symbolism. The Khmer Rouge leaders were arrested in 2007, and at first were charged only with crimes against humanity and war crimes. (There were four leaders at the time, but since then Ieng Sary has died and his wife, the Khmer Rouge minister for social affairs Ieng Thirith, has been declared unfit to stand trial because of dementia.) Genocide charges were brought two years later, and only in reference to the Vietnamese and the Cham. Nuon Chea’s lawyers challenged that decision. In an appeal last year citing “the sheer gravity” of the genocide charge and its “special and privileged role” as “an encapsulation of the Khmer Rouge period in the public mind,” they asked that it be included in the first part of the trial. Whether they really saw an opportunity to win an acquittal or simply wanted to kick up some dirt, you know something is amiss when a defendant is clamoring to be prosecuted, and ASAP, for genocide. The trial judges certainly face an awkward predicament, one more awkward still than the investigating judges did. They are damned if they rule there was no genocide against the Cham or the Vietnamese (meaning, there was no genocide at all). And they are damned if they rule there was a genocide (meaning, against some group other than the Khmer majority). Whatever they do, this internationally sanctioned court — which has cost some $220 million so far — will frustrate most Cambodian victims’ sense of what happened to them. This view is common, says So Farina, a researcher at the Documentation Center of Cambodia, or DC-CAM, who has interviewed several thousand Cham over the past decade. Most Vietnamese, for their part, have no desire to stand out, especially against Khmer Cambodians, according to Long Danny, another DC-CAM researcher. Many are poor, some are stateless, and most would rather keep a low profile: anti-Vietnamese sentiment still runs very deep in Cambodia. The perils of these paradoxes haven’t surfaced yet because the ECCC operates at a remove from daily life, and outside the court the same old talk of that other, generic kind of genocide still prevails. Educational and outreach efforts to parse the term’s legal and casual uses have been modest and mixed. DC-CAM, which was originally set up by Yale’s Cambodian Genocide Program to collect evidence of Khmer Rouge crimes, is credited with putting together in 2007 the first history book to describe the regime in any detail. The book largely forgoes the use of “genocide,” preferring to focus on facts, but the accompanying teacher’s manual uses the word liberally. And through its “Genocide Education” program, DC-CAM has been distributing posters with anti-“genocide” slogans to schools throughout the country. Even Muny Sothara, the counselor from TPO, and some victims’ lawyers have favored maintaining their clients in a state of constructive confusion. How much longer can such obfuscating work? Thouch Féniés Phandarasar, a Khmer refugee living in France who testified at the trial last year and flew back to Phnom Penh for the judgment earlier this month, told me she hadn’t realized how the court was handling the genocide charges until the week before the verdict, when she was briefed on the second phase of the trial. And then she was “outraged,” she said. Many Cambodians, like other people who survive mass crimes, seem haunted by that question with no answer: “Why?” But a moment after first asking it they often repeat it with this characteristic twist: “Why did the Khmer Rouge try to exterminate Cambodians?” If only the Khmer Rouge had tried to exterminate an ethnic or national group other than their own — if only their central purpose had been to commit a genocide –- then it might all make a bit more sense.